Love a scenic drive and fields of lavender? This mom does. Do the back-seaters need a break from the screens? Mine do. 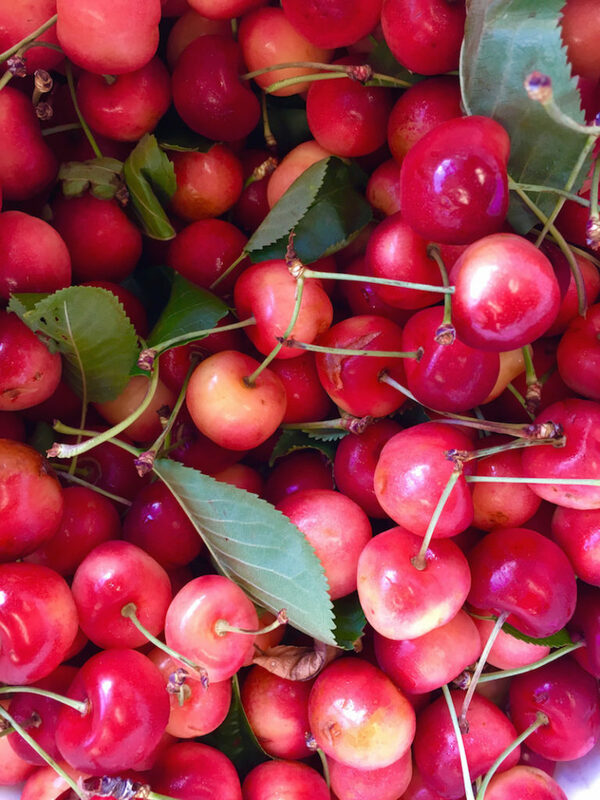 My SUV can’t pass up a Fresh Cherries sign along the country roads of Oregon’s Fruit Loop. 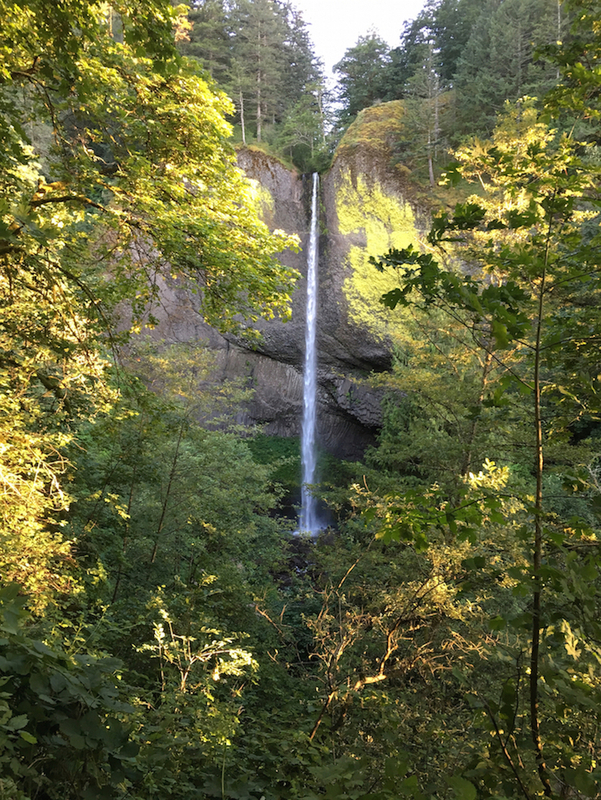 On a recent road trip, I found outdoor activities to keep my kids hiking and snacking along the Columbia River Gorge for days even saw some snow in July at a year-round ski destination. Oregon showcases seven wonders across its state, and one of the destinations is 30 miles east of Portland. The Columbia River Gorge National Scenic Area protects 80 river miles. It tops my list of scenic drives with its high concentration of waterfalls and diverse outdoor recreation. And what can be better than fresh fruit from the miles of orchards located just a few miles south? The Ice Age 15,000 years ago created the Columbia River Gorge, with its distinctive V shape. The uncontrolled flooding and seasons of freeze and thaw created the Columbia River Gorge’s high concentration of waterfalls to the delight of waterfall chasers, like me. The Native Americans used the Columbia River for transportation and trade, using wooden canoes to navigate the untamed river. In 1805, Lewis and Clark’s Expedition explored the Columbia on their way to the Pacific Ocean. The Army Corps of Engineers tamed Columbia River’s treacherous rapids in 1957 with the construction of the Bonneville Dam and The Dalles Dam. In 1986, Congress established the Columbia River Gorge as a national scenic area. I started my exploration of the Columbia River Gorge in The Dalles, at the eastern edge of the scenic area, 85 miles east of Portland, Oregon. Up first, the official interpretive center at the Columbia Gorge Discovery Center where my kids, 8, 12 and 13, went to work on the museum’s scavenger hunt. During our visit, we learned about how the pioneers reached the Pacific Northwest along the Oregon Trail and the rich, natural resources they discovered along the Columbia River. Learning about Lewis and Clark’s Expedition of 1805 and Oregon’s fish and fruit canning industry helped my kids understand the history of the Columbia River Gorge. Open daily from 9 a.m. to 5 p.m., adult admission is $9, kids from 6 to 16 is $5 and kids 5 and under enter for free. The Columbia River was once a wild waterway until the Army Corps of Engineers tamed it in 1957. To learn more about the importance of dams and water safety, we visited The Dalles Lock and Dam. 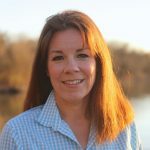 With the help of the visitor center and their Junior Ranger activity booklets, my kids learned about how fish use fish ladders and water safety. Open daily from 9 a.m. to 5 p.m., Memorial Day until Labor Day. Free. 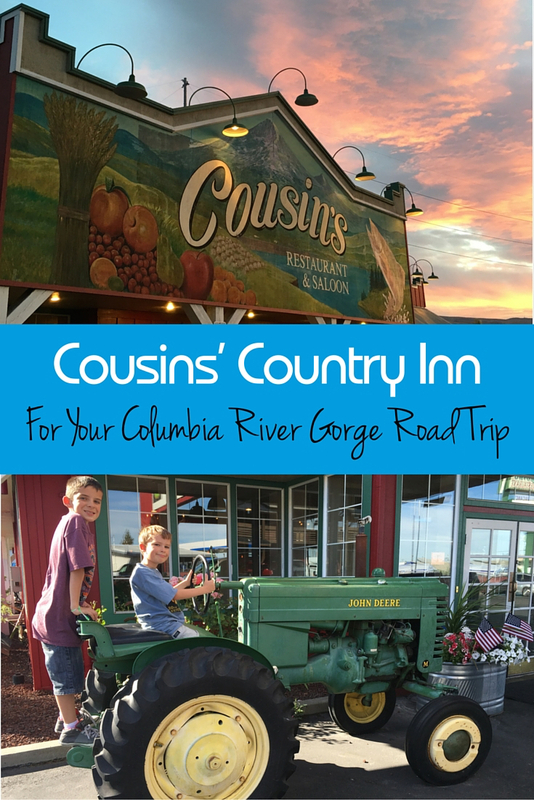 When road tripping when kids, I’m always looking for family fun stops and Hood River, a quaint town along the Columbia River Gorge, specializes in agritourism. 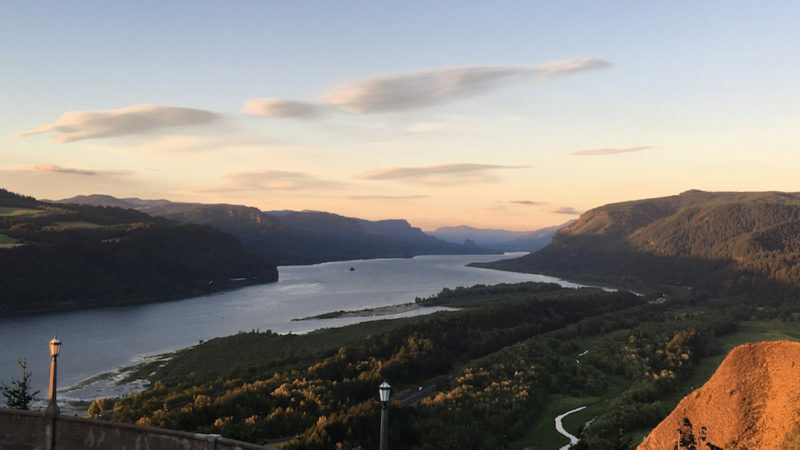 Driving along Interstate 84 towards Portland in the Columbia River Gorge National Scenic Area, Hood River, just 22 miles west of The Dalles, bulges with wineries, orchards, farm stands and lavender fields–perfect for family road trips. The Fruit Loop provides over 35 miles of country roads to meander and numerous fruit stands where we enjoyed samples of fresh fruit and baked goods. We drove the Fruit Loop during cherry season and I can still taste the fresh cherries, the ultimate road trip snack. The majority of cherry varieties I sampled aren’t exported since they’re too delicate for transportation. 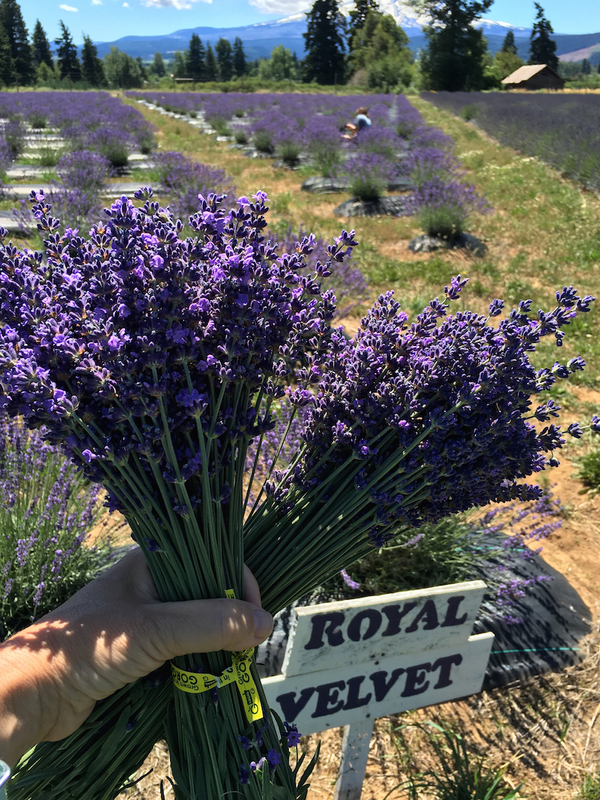 I adore lavender so a stop at Hood River Lavender Farms (3801 Straight Hill Road) to pick my own lavender bunches was mandatory. The gift shop offers lavender-infused bath and body products along with some lavender food items. 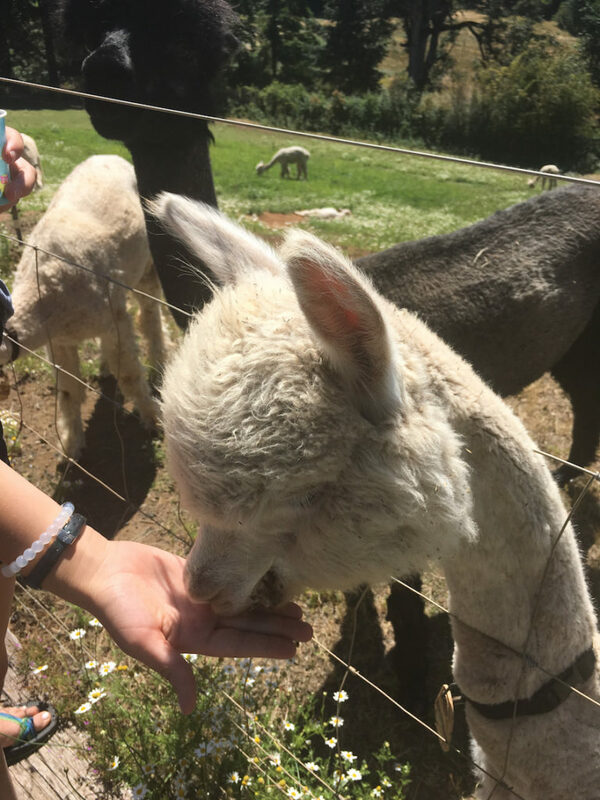 My kids love animals so we visited the alpacas at Cascade Alpacas and Foothills Yarn and Fiber (4207 Sylvester Drive). The spinning demonstrations helped my kids understand how the spinning wheel transforms alpaca fiber into yarn. My kids got to feed the alpacas during our visit. The baby alpacas were too darn cute! Waterfalls along the Columbia River Gorge offer spectacular hikes and envy-worthy photo opportunities. The most well-known waterfall, Multnomah Falls, located at exit 31 off of Interstate 84, is just the beginning. As a ribbon of water plummets 620 feet, it’s the second highest year-round waterfall in the U.S.
At Multnomah Falls, I found the Multnomah Falls Lodge offering a regionally-inspired menu along with a separate bar. The visitor center offers interpretive displays and the U.S. Forest Service Rangers hand out Columbia River Gorge Junior Ranger booklets for the kids and award niffy patches. Hike to the Benson Bridge, a .25-mile hike from the visitor center, or take the 1.2-mile hike to the top of the falls. Restrooms, a gift shop and snack bar offer the necessities. Don’t ignore the other waterfalls along the Columbia River Scenic Highway (Hwy. 30) that parallels Interstate 84. As the crowds diminish, the scenery increases and the other waterfalls require no hiking or short hikes. Horsetail Falls, 2.5 miles east of Multnomah Falls, along Columbia River Scenic Highway offers a 176-foot waterfall steps from the highway. The Wah-kee-na Falls, .5 miles west of Multnomah Falls, translates into most beautiful from the Yakama language. A 242-foot tiered waterfall awaits with a nearby picnic area. Bridal Veil Falls requires a short hike from the parking lot, one mile west of exit 28 off Interstate 84. Visitors gaze at the tiered waterfall set among a mossy forest. Latourell Falls, located in Guy W. Talbot State Park, features a 249-foot plunge fall a short hike from the parking lot. I can’t think of a better way to end a day of scenic driving than finding the ideal spot to catch the daily departure of the sun. I recommend finding a spot to sit on the steps of the Vista House at Crown Point, a memorial dedicated to Oregon pioneers and listed on the National Register of Historic Places. Built in 1918, it’s perched 733 feet above the Columbia River and the setting sun casts an amber glow in the windows. Mount Hood stands as a beacon along the Columbia River Gorge, rising up from the landscape with glaciers and year-round skiing. A relatively easy drive to Timberline Lodge allows day visitors to enjoy an summer ski destination and historic lodge. During my visit, I stayed in The Dalles, along the eastern portion of the Columbia River Gorge. Conveniently located right off Interstate 84, Cousins’ Country Inn offers all the necessities a mom needs, like self-service laundry and a pool for the kids. I appreciated the home-style meals of the onsite restaurant and my kids couldn’t get over the cinnamon rolls as big as their heads. Hood River, Oregon, is another option for lodging, located about half way through the Columbia River Gorge. Close to the western edge of the Columbia River Gorge is Portland, with numerous lodging and dining options. Columbia River Gorge’s 80-mile strip of Interstate 84 starts 30 miles east of Portland, Oregon, the closest international airport. Mount St. Helens National Volcanic Monument, another family favorite, is a quick 80 miles north along Interstate 5. Lewis and Clark National Historical Park gives kids a further understanding of the 1805 expedition with numerous sites along the Oregon coast at the mouth of the Columbia River, 120 miles west. Columbia River Gorge National Scenic Area is open 365-days a year and 24-hours a day. The National Park site doesn’t charge a fee; the waterfalls are also free to enter and park. 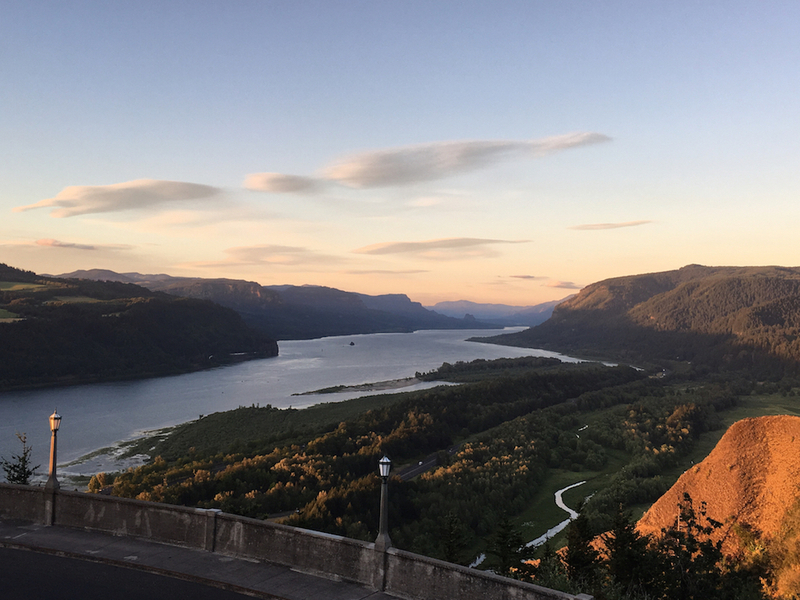 Interstate 84 runs the length of the scenic area, though I recommend exiting and driving the historic Columbia River Scenic Highway. Grab your fresh fruit first before passing it to the back seat. Kids can vacuum pounds of fresh fruit in minutes. Lavender can give some people headaches in high concentrations, like the car ride home. 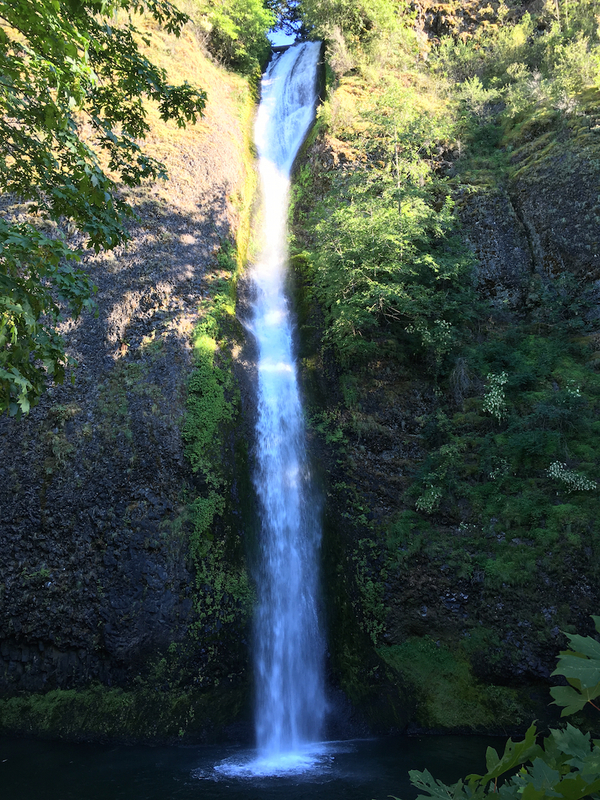 If parking is unavailable at Multnomah Falls, tour nearby Bridal Veil Falls and circle back around. wow Catherine, thank you for sharing this experience with us! 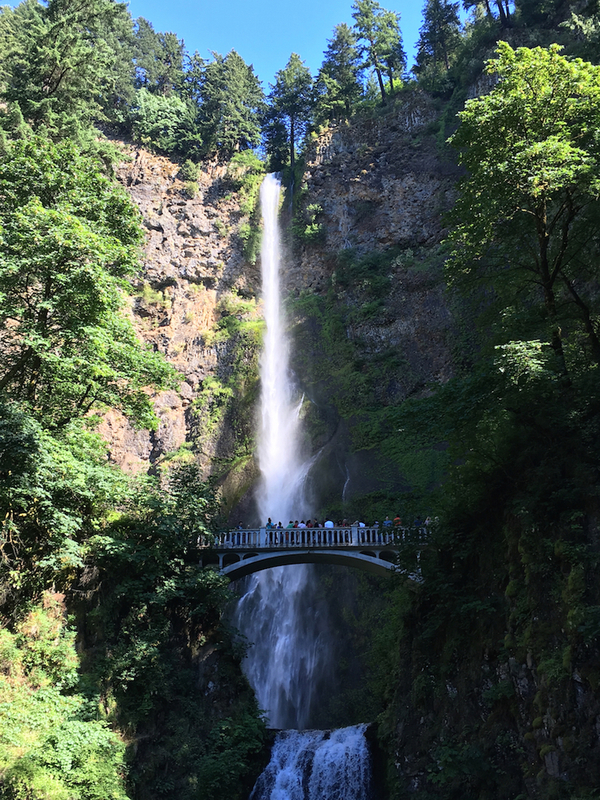 I am put in mind of Elie from “Up” when she says, “Adventure is out there!” After reading about your adventure here, I would say that truer words were never spoken 🙂 And your photos of the Multnomah Falls are spectacular! Thanks Dee! The waterfalls are amazing! Oregon offers spectacular scenery.